Extend the life of your shoes and your stability on the course by regular cleaning of your golf shoes. Golf shoes typically are made out of leather or synthetic materials, which can both get dirty easily during a round of golf. Since golf shoes can cost a lot of money, you want to extend their life as long as possible by regularly cleaning them. These are some general guidelines to follow when you clean golf shoes; refer to the manufacturer’s instructions for more specifics. Clean the upper part of the golf shoes using a mixture of mild soap and water. Wipe away any dirt using a towel moistened with the soap and water combination. Don’t soak the shoes since this can damage the material. Get rid of the scuff marks with a matching color of shoe polish. Shoe polishes can be applied to cover up the scuff marks that appear during regular use. Shoe polishes come in a variety of colors—including white, brown and black—and will include an applicator brush to apply the solution. Choose the type that can be applied to leather. Wipe away any dirt that appears on the outsoles of your golf shoes with the same soap-and-water mixture. You should wait at least 10 minutes after applying the shoe polish to continue to this step. You also can clean off the spikes on the soles when you complete this step. Treat the golf shoes with leather oil. 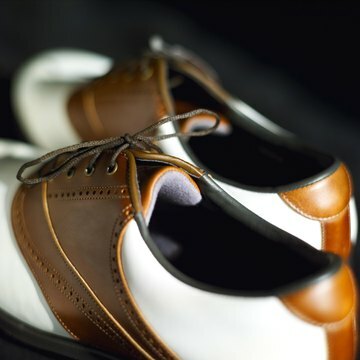 To finish cleaning the golf shoes and to make sure they retain their shine, apply a small amount of leather oil to the outsoles and uppers. Use a polishing cloth and a few drops of the oil to massage the mixture into each shoe.